Editor’s Note: This article about steering is just one installment of our El Cheapo street rod build. To see the rest of the articles, click here. Have you ever had one of those projects that was akin to herding cats? You would get three of them going the same direction, and six others would be running left and right. That’s a little bit of my experience with using old straight axles. Not to worry though. There is a way to get those cats all running in the same direction and make it safely to your destination. In our last installment, we covered running a straight axle in great detail. In this issue, we will cover steering, the system that plays a major role in the handling of your hot rod. 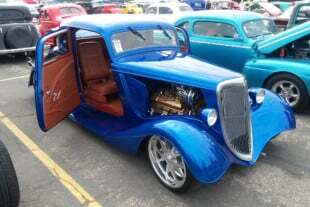 While at a show recently, I came across a man with a 1929 Ford coupe. He was about to pull his hair out with what he thought were axle issues. After examining his problem, I saw that it was all in his steering set up. Let me digress slightly to get into some myths about steering. Some builders think only a Vega or Corvair box will do – at the tune of about $300.00. This is not necessarily so. Most boxes will work fine with the exception of trying to use a power steering box on a non-powered steering set up. This will break your arms trying to steer the car. Some mandatory things to consider when selecting a steering box include inspecting previously used boxes. When choosing a used box, always check for play. By rotating the spline and watching the pitman arm move, you will notice any amount of play. When you move the spline shaft, the pitman arm should move immediately. The next step is to rotate the shaft all the way left to right. If there is a flat spot on a gear, you will feel it, and you should avoid that gearbox. Next step is to rotate the shaft to the left and make sure the pitman arm is moving forward and not backwards. It doesn’t matter if the pitman arm is pointing up or down as long as a left turn moves it forward. A quick look inside the filler cap will also help you. You will be able to see if the box is super dry, which means more than likely there is significant wear on the steering gears. The biggest question is where to mount the steering box? Where Will It Be Mounted? The first question to ask yourself is, “where is the box going to sit?”. Will it be out on the frame, or would you prefer it to sit in the cabin? If it’s going to sit inside, it will need a long side shaft to reach to the outside. I’ve noticed the old International Scouts and many of the old mail Jeeps had this kind of steering box. If the steering box will sit on the frame outside of the firewall, a ’92 Toyota truck box works great. It is a small box and has a factory knuckle which allows you to adjust your steering rod. The pitman arm hangs down and rotates forwards when turning left. This box is also very lightweight and easy to mount. Mounting is as easy as transferring your bolt pattern onto a piece of cardboard and then onto a 3/8-inch piece of steel. Once your box is where you want it, you can weld that plate onto the frame. Your bolt pattern will allow you to remove it anytime you wish. There are tons of boxes you can use, and with these tips, simply go out box hunting at a swap meet or recycle yard. These boxes at recycle yards or swap meets are around $25.00, however at a salvage junk yard you will pay two or three times that figure. The two types of steering setups used with hot rods are referred to as traditional (left) and cross steer (right). The next question to ask yourself is how am I going to set this up? If it is to be cross steering, which means the drag link will come off the box and run to the right side of your hot rod. This will require a box where the pitman arm is on the bottom and not the side. If it is to be traditional steering, the drag link will be connected to the pitman arm on the left side, and travel to a steering arm on your left front spindle housing. The cross steer setup will require a box where the pitman arm is on the bottom and not the side. There is another existing myth that states the cross steering setup handles better than traditional steering. To a point, that’s true. However, the aid of a panhard bar mounted to the left side of the frame and the other end mounted to the center of your straight axle will change the game. A steering slave can also be installed from the left side of your straight axle to the center of your tie rod. These two additions will totally level the playing field. With these additions, I can’t tell the difference between cross steer and traditional steer, Not only will they feel the same, but these additions will eliminate bump steer in the traditional setup. Bump steer is where you hit a pothole in the road and your front end shakes violently making you believe you’re about to meet your maker. My advice here would be to make sure you are ready to meet your maker, and lessen the chances by adding a panhard and slave steering damper. Some other words that will go a long way toward getting that hot rod down the road smoothly have to do with your drag link. Common sense will tell you that the shorter the drag link, the less chance you have for vibration and movement. Bump steer can be caused by any movement that sets the two front wheels at a tug-of-war with each other. Placing the steering box farther forward will help. Also, the pitch of the drag link will make a difference. The more level the link is, the better. If there has to be any pitch, it would be better for the end attaching to the pitman arm to be higher. The drag link running up hill to the steering arm is begging for harder steering. Many of the old straight axles had a steering arm that twisted down to the lower end of the spindle housing. Most speed shops offer aftermarket steering hoops that mount into the top two holes of your top spindle mounting bracket or backing plate. These are roughly $20.00, and will put your drag link more inline from the pitman arm to the steering arm. Touching on the steering box column rod that runs from the box to the steering wheel, I would simply add this. The basic rule of steering knuckles states that you can run up to three steering knuckles and still be safe. However this adds complications to any already complicated situation. If you are able to do a little planning on the front end, and place that box at a location to eliminate some of the knuckles. You will be better off. Do a little planning on the front end and place that box to eliminate some of the steering knuckles and keep things simple. Knuckles, like everything else, wear out with time, and in the process, allow more and more movement. Movement in a steering setup is not your friend! To get the maximum turning radius out of that old straight axle, be sure to count turns on your box shaft. The splines on this shaft will allow you to move the pitman arm. This will let you get the same movement going left and right. The stops on the axle will only let you go so far, but you want to make sure that it hits both right and left stops the same. There are many types of front end and steering options we could have used, but in our case it came down to cost and looks. From a looks standpoint, nothing is cooler than a traditional-steer straight axle on an open wheel roadster. From a cost standpoint, nothing is cheaper than this type set up. I travel each weekend to a show or swap meet in a six state area. I can’t speak for the world, but in my travels, these old straight axles seldom bring more than $100.00 to $150.00. 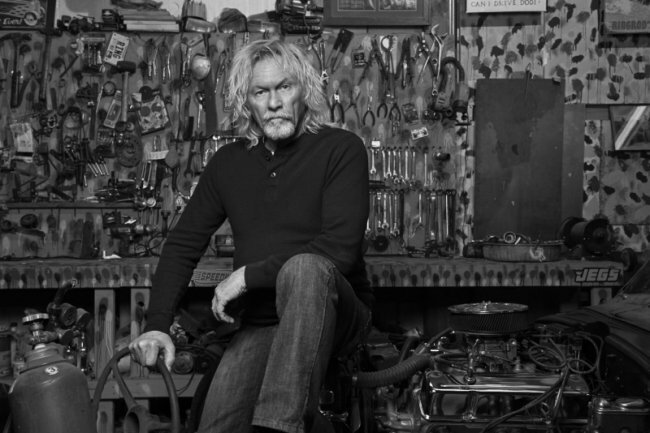 Looks are everything when it comes to hot rod suspensions and steering. I always check kingpins and after that, the most you might have to do is brake shoes and wheel cylinders. This saves you a fortune on an axle set up … like to the tune of $3,000.oo once you have to buy all of the bells and whistles that go with making a front axle workable. The choice is yours to make. I also sell brackets that mount to any old axle and converts it to a traverse spring set up. 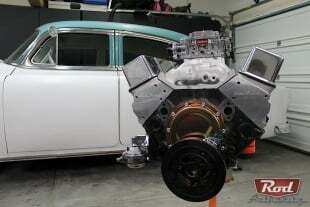 Go to RingRods HotRod Shop on the net and click on transverse spring. 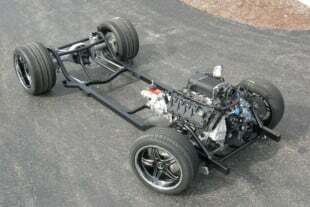 in the next issue, we will cover setting up the engine and transmission, along with tips on driveshafts.